This series will combine an informative guest speaker with action steps to enrich our community, dispel misinformation, and foster an environment of safe discussion. This forum will explore socially, culturally, and politically complex issues. Each subject will be explored over two months, a month of education and a month of action. Guest speakers will provide information on a spectrum of topics and give ways to act. Participants will be challenged to put what they learned into practice through such activities as service projects, sharing information with peers, and fundraising. The seminars are nonpartisan and free to the public. The guest speakers will be issue area experts and individuals sharing their person experiences. 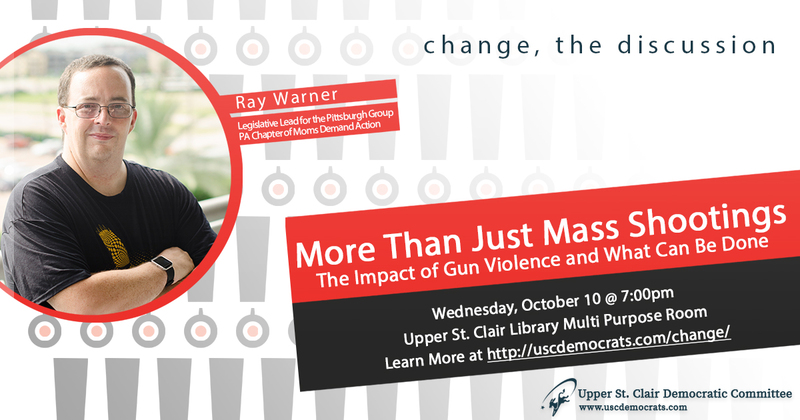 Ray Warner is a founding member and the current Legislative Lead for the Pittsburgh local group of the PA Chapter of Moms Demand Action for Gun Sense in America. Founded after the Sandy Hook shooting, Moms Demand Action is the largest grassroots gun violence prevention group in the US, with over 4.5 million members in every state.